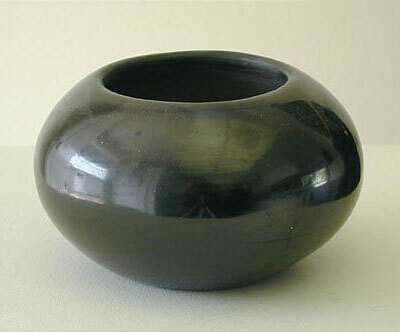 This blackware olla, of globular form, has a highly polished slip. It is signed on the base: "Maria Poveka". The simple olla form of this vessel is superb. This vessel was created by Maria Martinez, San Ildefonso Pueblo, (1887 - 1980). Martinez (1887-1980) was the master potter, matriarch, and the creative force of 20th Century San Ildefonso Pueblo, New Mexico. During a period of the 1950s, she began to sign her pottery "Maria Poveka", her native name. Condition: Aside from a 1/16" very minor blemish, this olla is in excellent condition. Provenance: This bowl was purchased directly from Maria Martinez in the 1950s by Mr. Harold Street of Santa Fe, former owner of the Taos Inn at Taos, New Mexico. It was later sold to the Kachina Shop at the Denver Museum of Natural History.